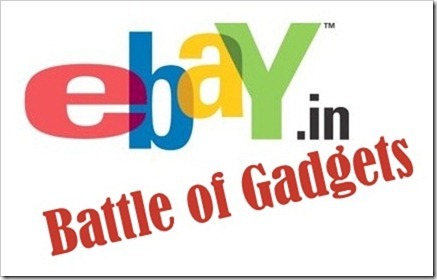 Ebay yesterday released “Battle of the Gadget” Rankings for the most popular gadget models & brands based on the transactions that happened on ebay between Jan 1st 2012 to March 31st 2012. The rankings showcases popular gadgets & brands across 4 categories of Laptops, Cameras, Mobile Phones & Televisions. Samsung has been making huge strides in India, not only in smartphones, but in other categories as well – It maintained the tag of most popular Gadget Brand with 31% of market share all 4 categories of Laptops, Cameras, Mobile Phones & Televisions. While Samsung was most popular brand for mobile handset and Television category, Nikon came up trumps in the Digital Camera category and Apple topped the laptop category. eBay transactions have also been growing at a healthy pace – According to the report, a mobile handset was sold on ebay site every 3 minutes, a laptop every 13 minutes & a digital camera every 25 minutes! Among Smartphones alone, Samsung captured over 35% of market share with Samsung Galaxy Note N7000 being the most popular Smart Phone. While Sony & Blackberry were neck-to-neck on the 2nd position. These 3 brands, Samsung, Sony and Blackberry, have together captured 87% of market share amongst transactions on Ebay in the smart phone category. Delhi was the top city when it came to number of mobile phones bought across India. Among the Dual Sim phones, Micromax is the leader, while Nokia X2-02 was the most purchased Dual SIM phone model. Bangalore consumers bought most Dual SIM phones on eBay India. The sale of digital camera’s grew by 26% in first quarter of 2012 as compared to previous quarter on eBay India. Nikon and Canon topped the overall Digital Cameras category with 27% each. Sony came in at 3rd position. Canon saw maximum growth in Digital Camera category with a growth of 84% over previous quarter and Canon EOS 550-D was the most purchased Digital Camera Model. Bengaluru followed by Delhi and Chennai were the top three cities respectively, who bought maximum number of Digital Cameras. Sony was the most popular brand when it came to compact camera’s, while Canon was the brand most bought in Digital SLR Category. Apple jumped to top in first quarter of 2012 in number of transactions of eBay putting Dell in the 2nd position. Tablets dominated the category with 44% share and iPad 2 being the most purchased Model. Bangalore was once again forefront as the city that bought maximum gadgets in laptop category on eBay. In the netbook category Acer was most popular with Aspire One being the most sought after netbook model. Netbook demand is now currently going down with market share now shifting towards tablets. Among the tablets, iPad 2 was the leader. The demand for 3G enabled tablet was on rise with 30% of all tablets purchased were 3G enabled. Samsung ruled the television category with Samsung 40D5000 being the most purchased television by Indians on eBay. LCD TVs led with 55% market share followed by LED TVs with 38% market share. Bengaluru bought the most TVs in India. eBay’s Battle of Gadget survey clearly shows that ecommerce is on the rise in India and reiterates the fact that Indians love buying gadgets online. Indians prefer Second Hand properties over New! Camera ranking appearing under headline “Mobile Phone Category Rankings” it should be “Camera Category Rankings”. Thanks Upendra for pointing out… We have rectified it..